We soon learnt that it was true. The cycles and cyclists were one of the most interesting aspects of Amsterdam. Everybody in Amsterdam uses a bike to commute including frail looking old ladies driving back from the grocery store, young parents with modified baby carriers attached to their bike, professionals with crisp blazers and blackberrys, teenagers, school children and of course wide-eyed tourists. And the locals know that this is an attraction in itself. In fact the bicycle parking station at Amsterdam’s Central station was one of the highlights pointed out to us by the tour-guide when we took a canal cruise that evening. Thousands and thousands of bikes in a four storey parking lot! What was strange to me is that these cycles were not spanking new sports bikes with several gears and fancy features and multiple cup-holders that is the usual bike in the US but infact quite shabby and run-down basic models. Kind of strange to see a guy in the latest three piece suit with a smartphone clipped to this ear drive a cycle similar to the doodhwala. 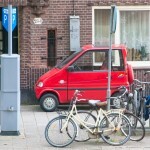 Amsterdam was a marvelously walkable city. And with bikes, buses, trams, boats and trains (from one point we actually saw all of these modes of transportation at the same time!! ), the city was easy to navigate –even with two one year olds in their strollers. 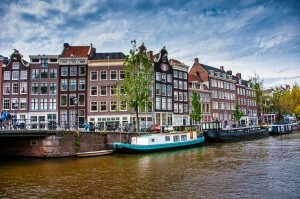 Amsterdam has three semicircular canals running right through the middle of the city. 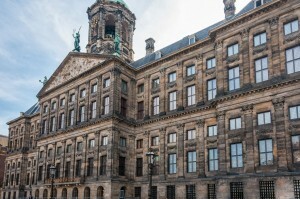 We took a canal cruise on the evening of the very first day – just to get an overview of the city and some of its highlights. We were kind of jetlagged , so I didn’t enjoy it as much as I should have. The next day we took the bus to Zaanse Schaans, about a 40 minute bus ride from Amsterdam city. Zaanse Schaans is a tourist village created on the banks of the Zaan river and I found it to be a cross between a very touristy museum and a theme park. Despite the lack of authenticity, it was loads of fun. 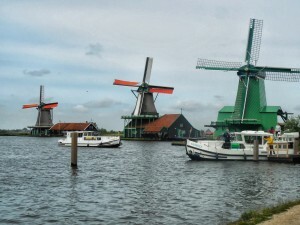 The highlight of the place are the windmills – these are ’supposedly’ working windmills . The one that we spent the most time in was a spice mill. The energy created by the windmill was used to grind spices and these spices were of course available for sale! 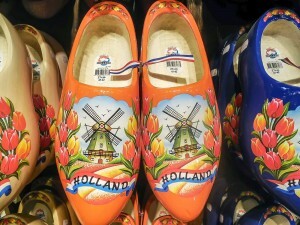 Apart from the mills, there were many tiny museums exhibiting the various things that Amsterdam is famous for : the clogs, cheese, pewter works, pottery and so on. To Annika’s delight, there were plenty of animals about – hens and ducks and sheep and pigs and even an ice-cream eating goat! 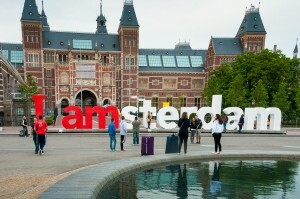 We spent a very pleasant day there and returned by the bus to Amsterdam city. Unfortunately the ending to the day was quite sad. We found out later that Seejo’s camera bag was missing. After frantic search, we had to give it up as a lost cause. We had last noticed it on the bus but then we were not sure whether we forgot it in the bus or if it was flicked while we were browsing through the souvenir shops. It was a huge downer after such a wonderful day. The next morning while Seejo went off to purchase a new camera and lenses, the rest of us went to see the Van Gogh Museum. As my family’s combined knowledge of art just about amounts to knowing that Van Gogh was a painter, we just did a quick tour. 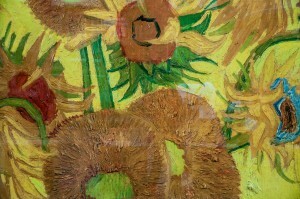 Of all his work, I liked the sunflower series of paintings best. Although it was painted at a time while Van Gogh was going through personal angst, I found the paintings to be very cheerful and upbeat. We spent the afternoon at the Museumplein open air park – enjoying the people, the live music and the atmosphere. 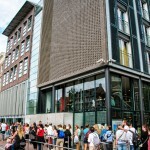 Seejo joined us at our next stop: the Anne Frank Museum. As expected, it was an emotional experience to see the small rooms where Anne and her family, along with 4 other people hid for two years. While reading the book, I had mistakenly assumed that the secret rooms were a floor above the main office but that wasn’t the case. It was just behind a bookcase on the SAME floor. And when you see the actual location, it is amazing to think that they were hiding in the middle of the city with just one closed door away from the office that had employees walk in and out. I am amazed that they managed to hide for over two years given the circumstances. 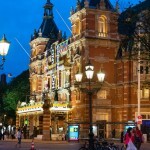 By this time it was evening and we made our way to Dam Square, the town square at the historical center of Amsterdam. It was fairly unremarkable square compared to town squares in other European cities. We had several options to eat though. Leaving my mom and Asif with the kids in a little cafe, Seejo , Dwiti and I went to see the Red Light District. This was indeed a revelation. Lingerie clad women standing or sitting as window decorations in front of large dsiplay windows that have twinking red lights to attract attention. The normalcy of the situation was astounding. Folks walking buy could literally window shop — if you like what you saw, you just go in the door! Between these “store-fronts”, were other businesses including a kindergarten! Our next stop was to have dinner at an Indonesian restaurant – Sama Sebo. Surprisingly the most popular food in Amsterdam is not the local cuisine but Indonesian rice-plates or rijstaffel (rice tables). These consists of several curries served with rice and condiments. The food was quite good and Amma and Asif were relieved to have some rice and curry after all of the eating out that we had done so far. Then while Asif and Amma proceeded home, Seejo, Dwiti and I stopped at the Leidseplein to check out the nightlife at Amsterdam. And it was a bustling nightlife– although it was nearly 11 pm, restaurants were full,it was crowded and noisy and there was a nice party vibe to the place. The next day, we took the 9 am Thalys to Paris. Despite spending only 2.5 days in Amsterdam, we felt like we got to see most of what we wanted and get a real taste ofAmsterdam. Almost everyone understood or spoke English (always makes travel less of a hassle), it was easy to travel with two babies and above all it was a beautiful city with canals and pretty town-squares and really really laid-back people . Just beware of the cyclists!